Achondrogenesis is classified as type I (ACGIA, ACGIB) and type II forms (ACGII). Achondrogenesis type II, hypochondrogenesis, and neonatal spondyloepiphyseal dysplasia congenita are now known to be phenotypic variants of the same disorder. Achondrogenesis results from mutations in the TRIP11 (ACGIA), SLC26A2 (ACGIB), and COL2A1 (ACGII) genes, with achondrogenesis types IA and IB being autosomal recessive conditions and achondrogenesis type II most often being sporadic. Prenatally, polyhydramnios and hydrops leading to fetal demise can be observed. Skeletal anomalies include severe micromelia, a short and narrow thorax with pulmonary hypoplasia, and absent or very abnormal ossification of the skull and vertebral bodies. Marco Fraccaro first described achondrogenesis in 1952. He used the term to describe a stillborn female with severe micromelia and marked histologic cartilage changes. The term was later used to characterize the most severe forms of chondrodysplasia in humans, which were invariably lethal before or shortly after birth. By the 1970s, researchers concluded that achondrogenesis was a heterogeneous group of chondrodysplasias lethal to neonates; achondrogenesis type I (Fraccaro-Houston-Harris type) and type II (Langer-Saldino type) were distinguished on the basis of radiologic and histologic criteria. 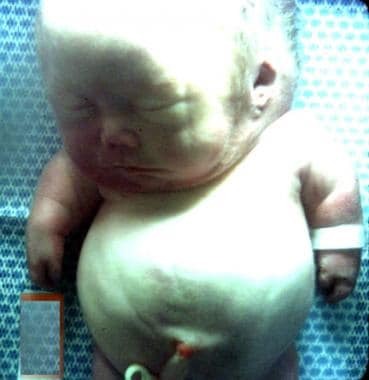 An infant with achondrogenesis type II. Note the disproportionately large head, large and prominent forehead, flat facial plane, flat nasal bridge, small nose with severely anteverted nostrils, micrognathia, extremely short neck, short and flared thorax, protuberant abdomen, and extremely short upper extremities. In 1983, a new radiologic classification of achondrogenesis (types I-IV) by Whitley and Gorlin was adopted in the McKusick catalog. According to this classification, type I and type II have the same femoral cylinder index (CIfemur; calculated as length of femur divided by width of femur) range (1-2.8). Both types have crenated ilia and stellate long bones. Multiple rib fractures are characteristic of type I but not type II. Type III has nonfractured ribs, halberd ilia, mushroom-stem long bones, and a CIfemur of 2.8-4.9. Type IV has nonfractured ribs, sculpted ilia, well-developed long bones, and a CIfemur of 4.9-8. This radiologic classification based on the CIfemur was later abandoned. Researchers suggested that achondrogenesis type III probably corresponds to type II and that type IV probably corresponds to mild type II (hypochondrogenesis). This posteroanterior (PA) view radiograph of an infant with achondrogenesis type II shows the relatively large calvaria with normal cranial ossification, short and flared thorax, bell-shaped cage and shorter ribs without fractures, relatively well ossified iliac bone with long crescent-shaped medial and inferior margins, and short tubular bones. The sacrum, pubis, and ischium are not visible. 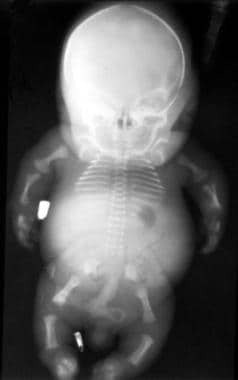 Lateral view radiograph of an infant with achondrogenesis type II. Note the relatively large head with a normal cranial ossification and enlarged fontanelles, short ribs, absent sternal ossification, ossification only in anterior parts of the vertebral bodies, and short and curved femora. In the late 1980s, structural mutations in collagen II were shown to cause achondrogenesis type II, which thus constitutes the severe end of the spectrum of collagen II chondrodysplasias. Achondrogenesis type I was subdivided further in 1988 on the basis of convincing histologic criteria. It was subdivided into type IA, which has apparently normal cartilage matrix but inclusions in chondrocytes, and type IB, which has an abnormal cartilage matrix. Classification of type IB as a separate group has been confirmed by the discovery of its association with mutations in the diastrophic dysplasia sulfate transporter (DDST) gene, making it allelic with diastrophic dysplasia. Currently, three variants of achondrogenesis have been defined based on radiologic and histopathologic features: type IA (Houston-Harris), type IB (Parenti-Fraccaro), and type II (Langer-Saldino). Achondrogenesis IA is caused by recessive mutations in the TRIP11 gene, type IB results from recessive mutations of the SLC26A2 gene, and type II is caused by autosomal dominant mutations of the COL2A1 gene. Several heritable osteochondrodysplasias have now been recognized as members of the family of type II collagen disorders, all of which result from dominant mutations in the COL2A1 gene. [5, 6, 4] Phenotypes within this group range from severe lethal dwarfism at birth to relatively mild conditions with precocious osteoarthrosis and little or no skeletal growth abnormality. Achondrogenesis II-hypochondrogenesis and lethal spondyloepiphyseal dysplasia congenita (SEDC) represent the more severe end of the spectrum. These entities are characterized by severe disproportionate short stature of prenatal onset. The distinction between these phenotypes is mainly based on clinical, radiographic, and morphological features but considerable phenotypic overlap often hampers proper classification. Mutation of the TRIP11 gene, located on chromosome 14q32, has been identified in ACGIA. Mutational change leads to abnormal secretion of Golgi microtubule-associated protein 210 (GMAP-210), a protein associated with skeletal development. A series of mutations in the SLC26A2 gene, on chromosome 5q32, have been identified in patients with ACGIB. Homozygosity or compound heterozygosity for these mutations leads to premature stop codons or structural mutations in transmembrane domains and abnormal synthesis of sulfated proteoglycans in cartilage. Heterozygous mutations in the COL2A1 gene, located on chromosome 12q13, have been identified in ACGII, as well as in other type II collagenopathies (eg, spondyloepiphyseal dysplasias, hypochondrogenesis). Type II has a single base change, substituting serine for glycine in the type II procollagen gene of the alpha 1(II) chain. This disrupts the triple helix formation, leading to a paucity of type II collagen in the cartilage matrix. Epiphyseal cartilage lacks type II collagen. It is replaced by type I and type III collagens, which are not normally produced by chondrocytes. Differentiated chondrocytes do not express type II collagen. In addition to skeletal abnormalities, severe pulmonary hypoplasia, thought to be directly related to the underlying pathology in collagen expression, is associated with achondrogenesis. Type II achondrogenesis/hypochondrogenesis (Whitley and Gorlin prototype IV) has immunohistologic findings that demonstrate apparent abnormal intracellular accumulation of type II collagen within vacuolar structures of chondrocytes. This suggests the presence of abnormal, poorly secreted type II collagen. Molecular defects of type II collagen and new dominant mutations account for the observed phenotype. Lethal achondrogenesis types I and II are both rare, with prevalence ranging from 0.09-0.23 in 10,000 births. Achondrogenesis type I results in stillbirth more frequently than type II. Babies with achondrogenesis type I who are not stillborn typically have a shorter gestation and survive for a shorter time than those with type II. They are also smaller with much shorter limbs, which supports the general view that type I is the more severe form. Achondrogenesis has no racial predilection. 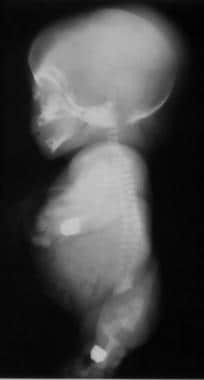 Achondrogenesis is detected prenatally or at birth because of typical clinical, radiologic, histologic, and molecular findings. Fraccardo M. Contributo allo studio delle malattie del mesenchima osteopoietico: l achondrogenesi. Folia Hered Path. 1952. 1:190-208. Whitley CB, Gorlin RJ. Achondrogenesis: new nosology with evidence of genetic heterogeneity. Radiology. 1983 Sep. 148(3):693-8. [Medline]. Nakashima Y, Sakamoto Y, Nishimura G, Ikegawa S, Iwamoto Y. A novel type II collagen gene mutation in a family with spondyloepiphyseal dysplasia and extensive intrafamilial phenotypic diversity. Hum Genome Var. 2016. 3:16007. [Medline]. [Full Text]. Mortier GR, Weis M, Nuytinck L, et al. Report of five novel and one recurrent COL2A1 mutations with analysis of genotype-phenotype correlation in patients with a lethal type II collagen disorder. J Med Genet. 2000 Apr. 37(4):263-71. [Medline]. [Full Text]. Spranger J, Winterpacht A, Zabel B. The type II collagenopathies: a spectrum of chondrodysplasias. Eur J Pediatr. 1994 Feb. 153(2):56-65. [Medline]. Freisinger P, Bonaventure J, Stoess H, Pontz BF, Emmrich P, Nerlich A. Type II collagenopathies: are there additional family members?. Am J Med Genet. 1996 May 3. 63(1):137-43. [Medline]. Borochowitz Z, Lachman R, Adomian GE, Spear G, Jones K, Rimoin DL. Achondrogenesis type I: delineation of further heterogeneity and identification of two distinct subgroups. J Pediatr. 1988 Jan. 112(1):23-31. [Medline]. Forzano F, Lituania M, Viassolo A, Superti-Furga V, Wildhardt G, Zabel B. A familial case of achondrogenesis type II caused by a dominant COL2A1 mutation and "patchy" expression in the mosaic father. Am J Med Genet A. 2007 Dec 1. 143A(23):2815-20. [Medline]. Barat-Houari M, Sarrabay G, Gatinois V, et al. Mutation Update for COL2A1 Gene Variants Associated with Type II Collagenopathies. Hum Mutat. 2016 Jan. 37 (1):7-15. [Medline]. Ipek MS, Akgul Ozmen C. Skeletal Dysplasias That Cause Thoracic Insufficiency in Neonates: Illustrative Case Reports. Medicine (Baltimore). 2016 Apr. 95 (14):e3298. [Medline]. [Full Text]. Grigelioniene G, Geiberger S, Papadogiannakis N, et al. The phenotype range of achondrogenesis 1A. Am J Med Genet A. 2013 Oct. 161A (10):2554-8. [Medline]. Bonafe L, Mittaz-Crettol L, Ballhausen D, et al. Achondrogenesis Type 1B. GeneReviews. Updated 2013 Nov 14. [Medline]. [Full Text]. Hernandez-Andrade H, Yeo L, Goncalves LF, Luewan S, Garcia M, Romero R. Fetal Musculoskeletal System. Norton ME, Scoutt LM, Feldstein VA, eds. Callen's Ultrasonography in Obstetrics and Gynecology. 6th ed. Philadelphia: Elsevier; 2017. 272-345. Lee HS, Doh JW, Kim CJ, Chi JG. Achondrogenesis type II (Langer-Saldino achondrogenesis): a case report. J Korean Med Sci. 2000 Oct. 15 (5):604-8. [Medline]. [Full Text]. Knowlton S, Graves C, Tiller G, Jeanty P. Achondrogenesis. The Fetus. 1992. 2:7564.
van der Harten HJ, Brons JT, Dijkstra PF, Niermeyer MF, Meijer CJ, van Giejn HP. Achondrogenesis-hypochondrogenesis: the spectrum of chondrogenesis imperfecta. A radiological, ultrasonographic, and histopathologic study of 23 cases. Pediatr Pathol. 1988. 8(6):571-97. [Medline]. Taner MZ, Kurdoglu M, Taskiran C, Onan MA, Gunaydin G, Himmetoglu O. Prenatal diagnosis of achondrogenesis type I: a case report. Cases J. 2008 Dec 18. 1(1):406. [Medline]. [Full Text]. Comstock JM, Putnam AR, Sangle N, Lowichik A, Rose NC, Opitz JM. Recurrence of achondrogenesis type 2 in sibs: Additional evidence for germline mosaicism. Am J Med Genet A. 2010 Jul. 152A(7):1822-4. [Medline]. Hall JG. Review and hypotheses: somatic mosaicism: observations related to clinical genetics. Am J Hum Genet. 1988 Oct. 43(4):355-63. [Medline]. Spranger J, Menger H, Mundlos S, Winterpacht A, Zabel B. Kniest dysplasia is caused by dominant collagen II (COL2A1) mutations: parental somatic mosaicism manifesting as Stickler phenotype and mild spondyloepiphyseal dysplasia. Pediatr Radiol. 1994. 24(6):431-5. [Medline]. Fryns JP, Kleczkowska A, Verresen H, Van Den Berghe H. 1983. Germline mosaicism in achondroplasia: A family with three affected siblings ofnormal parents. Clin Genet. 1983. 24:156-158. Cohn DH, Starman BJ, Blumberg B, Byers PH. Recurrence of lethal osteogenesis imperfecta due to parental mosaicism for a dominant mutation in a human type I collagen gene (COL1A1). Am J Hum Genet. 1990 Mar. 46(3):591-601. [Medline]. Faivre L, Le Merrer M, Douvier S, et al. Recurrence of achondrogenesis type II within the same family: evidence for germline mosaicism. Am J Med Genet A. 2004 Apr 30. 126A(3):308-12. [Medline]. Jana M, Nair N, Gupta AK, Kabra M, Gupta N. Pelvic radiograph in skeletal dysplasias: an approach. Indian J Radiol Imaging. 2017 Apr-Jun. 27 (2):187-199. [Medline]. [Full Text]. An infant with achondrogenesis type II. Note the protuberant abdomen and extremely short lower extremities. Photomicrographs of the costal cartilage of an infant with achondrogenesis type II. This shows prominent hypercellularity, large chondrocytes, deficient matrix, and abnormally large, stellate cartilage canals. The left image is X42, and the right image is X106.